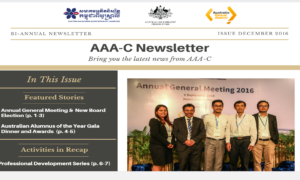 With the funding support from DFAT, the Australian Alumni Association of Cambodia is hosting a Thematic Workshop under the theme “Cambodia Environmental Governance Reforms”. 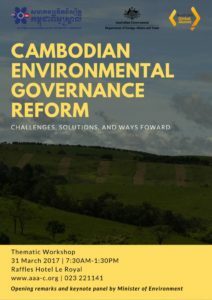 This workshop aims to be a platform for experts and policy makers from government institutions, academia, civil society organizations and private sector to discuss, share ideas, and insights on the topic and to identify possible solutions to challenges in Cambodian environmental governance reform. 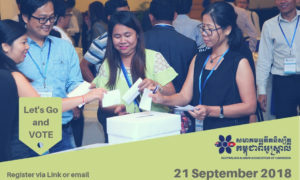 The workshop will bring together representatives from the government, development partners, non-governmental organizations and private sectors to be guest speakers in the panel sessions on two different sub-themes: Full and effective participation of stakeholders, and challenges and solutions. The concept note and the tentative agenda, visit this link.